The Mayberry subsidence prevention and tule growing program is in full swing. A permanent marsh has now completely replaced the seasonal marsh we created over a period of years and we sure miss it. In past years we would sit in camp at dusk and watch thousands of waterfowl descend onto the property. Now a handful of ducks arrive. There’s just nothing there for them. Deep water and a lack of duck food seem to be the biggest problems with attracting ducks at Mayberry. The new channels are about four feet deep, about double the maximum attractive to puddle ducks. Open water doesn’t produce good cover. The ducks just aren’t using the property. This is pretty much as expected. Seasonal marsh was a rare and treasured commodity that few people appreciated. It is unfortunate that it was not a higher priority for preservation. I am very saddened by its loss and it can never be reserected. Maybe we’ll find a silver lining in this cloud next year after the marsh has time to develop, but permanent water will never be as attractive to wintering waterfowl as seasonal marsh that contained a variety of the wetland plants ducks feed on during the harsh winter weather. So far this year I”ve bagged a dozen ducks in eight days of hunting from the Final Approach duck boat. I’ve enjoyed some success by laying low in the remaining cover, but I’ve changed my policy from the “all greenheads” days. So far this year six of my ducks have been greenheads, one hen mallard and the rest a mix of other puddle ducks – even a couple spoonies. 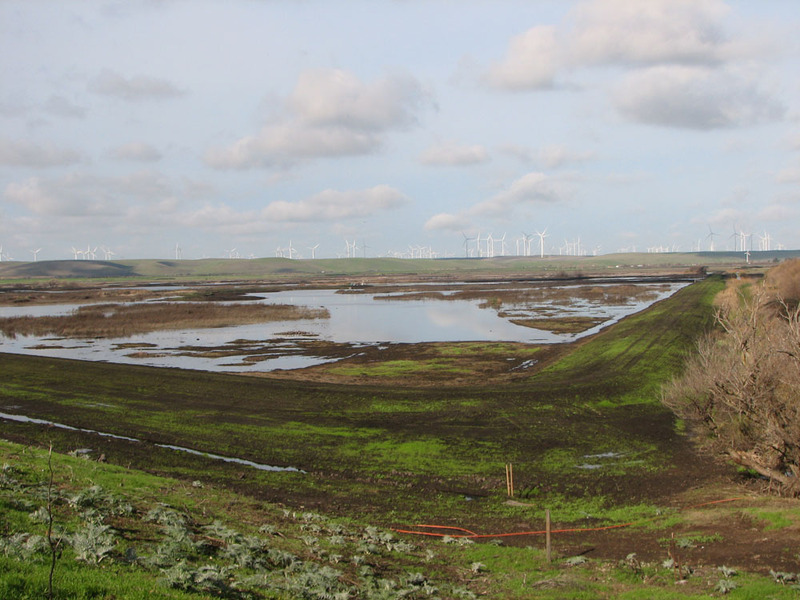 The levees are beginning to sprout grass and the ponds are mostly deep open water. We bagged about eight roosters during pheasant season, pretty good considering the lack of upland habitat. I loaded the Final Approach duck boat onto a trailer for transport to Webb Tract. Later this week I'll find out how it works in the flooded corn. With a month left to hunt ducks, I’m planning to turn up the heat and see if I can bag a few waterfowl. So far I’m behind schedule. Accessing property via a road that has no deeded rights is common. In the hills around Livermore, very few of the landowners have right-of-ways that have been validated by an official grant of easement. On the other hand, very few of these access roads are disputed. The land seldom changes hands, so the owners are known to other landowners along the route. Good neighbor policy is to leave reasonable people alone and not create a Hatfield’s and McCoy situation. In our case, most of the property along our access road is owned by the City and County of San Francisco. This is a situation with both good and bad implications. When seeking to have the owners sign a grant deed that could be recorded to validate our rights, we were told they could not do that as they were planning to sell their piece and the purchasers were not interested in buying if a right-of-way existed. Thus we sued to establish our right. For the early years of my life, I dreaded law suits and therefore avoided legal action at almost all cost. Now, after having courtroom experience, I’ve concluded that when you believe you’re right, court is a good place and having concluded that we’re right, it looks like that’s where we’re headed. This battle of LaCosta Ridge has motivated me to learn about the history of the road and it’s very interesting. The earliest inhabitants were Ohlone Indians. They gave way to Spanish Missionaries in the late eighteenth century. The area down stream of our ranch became known as Rancho El Valle de San Jose and a Spanish Mexican land grant turned most of the bottom land over to the Bernal family – soon to become also known as the Sunols (by marriage). Thus leading to the name for the railroad town at the head of Niles Canyon – Sunol. When California became a state, there was some debate about the validity of their Land Grant ownership, so a land commission was formed to validate the Spanish Mexican land grants and validate they did. Shortly thereafter the upstream area, now best described by the Public Property Survey System, was surveyed with the intent by the U.S. Government of selling. The Township in which our ranch is located is Tier 4 South, Range 2 East, Mount Diablo Base and Meridian. And, the parcels within this township were created by surveys that took place about the time of the Civil War. Not long after the Civil War, the properties of this township were sold and the land transfers took place by U.S. Land Patents. In most cases the Homestead Act. During this time, the homesteaders utilized the land by grazing cattle, sheep and horses. Learning about the history of our ranch has been enjoyable, but it also makes us realize that there were many before us. The first recorded documents related to road access to the area occurred in 1882 when a group of about twenty people petitioned the County of Alameda to make the access road a County Road, which they did. But the County Road was abandoned in 1922. One thing we’ve learned while preparing for this law suit is that right-of-way law is very complex. Fortunately for us, it looks like the story of our rights is simple. From midnight ’til dawn, rain beat down on the roof of our trailer. When you’re sleeping below sea level, and you’ve experienced delta flooding, you just don’t sleep all that well. Late December and early January are the time of year when winter rains threaten delta islands. We’ve been hunting on Webb tract for well over thirty years and we’ve been flooded out once since we purchased in 1977. Fortunately we weren’t hunting on the day of the event, but it was duck season and we could have been. 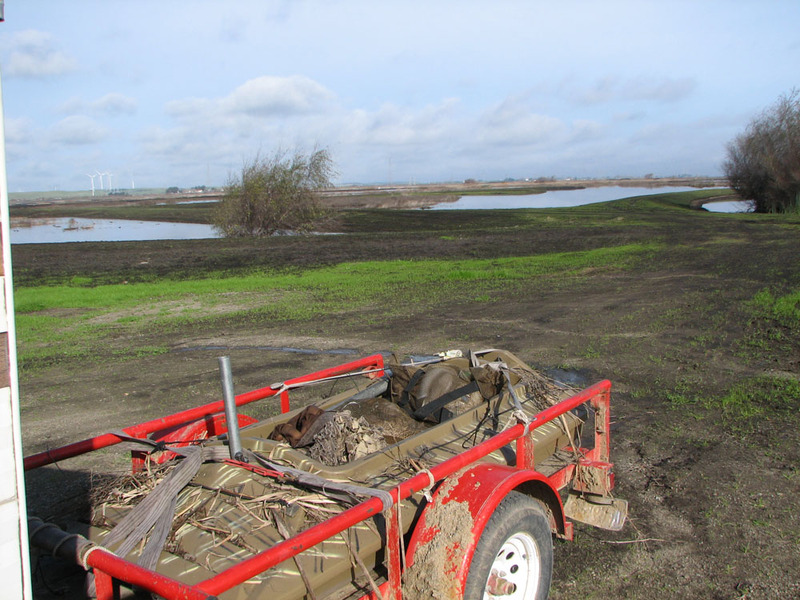 The levee break wiped out our 50′ trailer, washed away a bunch of decoys and wiped out our duck blinds. Heavy rain, strong winds and high tides are a serious threat to delta islands – many of which have been under one time or another. Then there are those that didn’t recover – Frank’s Tract, Little Mandeville, Big Break, Liberty Island and Little Frank’s to name a few. The duck and goose hunting is often at it’s best when the islands are most susceptible to going under. It’s an eery twist to add to your hunt. That’s why I told my hunting partner that we’d be moving our vehicles out to the levee before we began hunting. It’s better to be safe than sorry. As we drove the flooded island road to the levee, we passed farm equipment, most of it parked on top of the highest sand hills. The delta farmers can’t afford to risk their equipment. 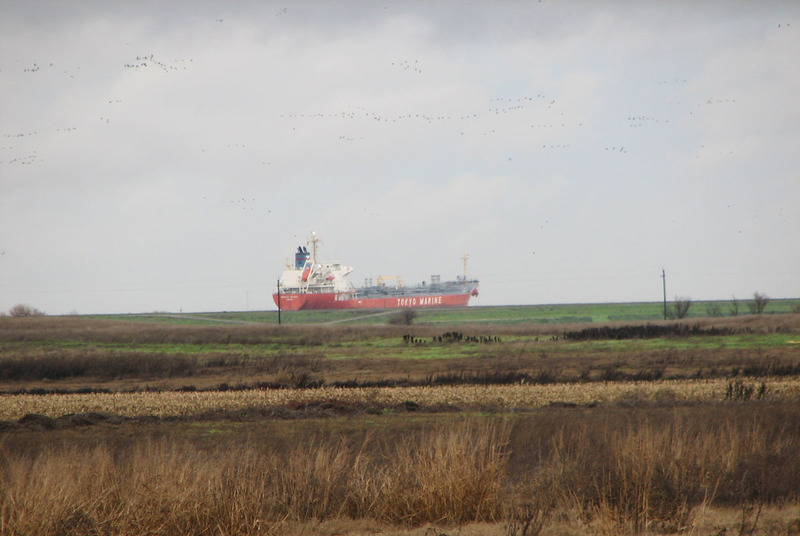 As ships travel the channel to Stockton, they appear to be sitting on top of the levees. I like wool clothing, but it’s often expensive and not appropriate to suggest as a Christmas gift. So, I looked around on the Cabela’s web site and found a few wool items that are reasonably priced. You can spend a lot more than this if you choose, but I wouldn’t be afraid to gift these. The Livermore-Pleasanton Chapter of The Mule Deer Foundation will hold its annual banquet on Thursday March 10 2011. The event will take place at the Palm Event Center on Vineyard Avenue, Pleasanton. The local committee is now holding monthly meetings in preparation for the event. Tickets will go on sale in January. 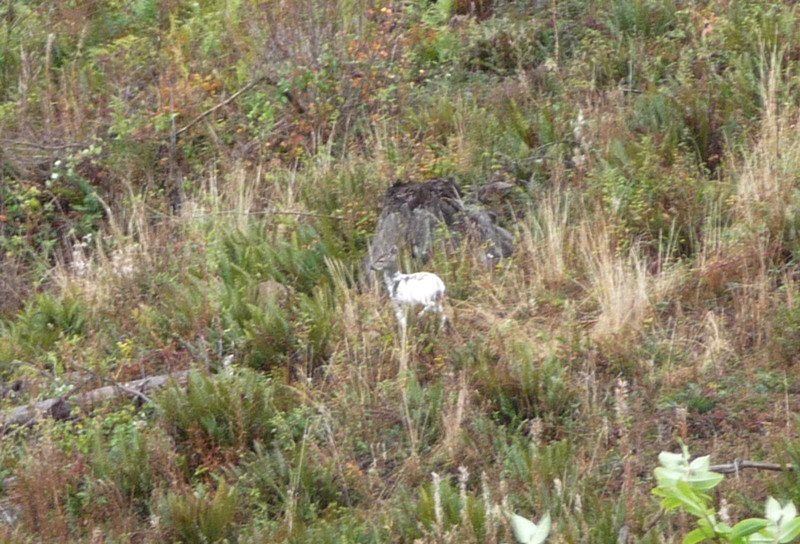 Photos of piebald deer are rare. However, the West Coast of Washington is home to the gene that produces this color abnormality in blacktail deer and occasionally photos pop up. Here’s a shot I received from George DeBell, a Seattle hunter who found this deer approximately ten miles west of Centrailia, WA. 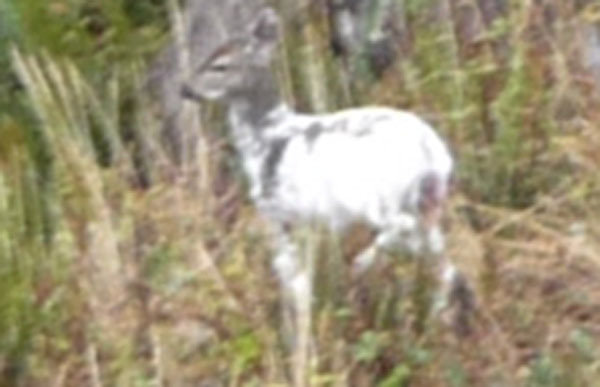 Piebald deer have both normal and abnormal coloring.